Perched high above the town of Moos in the Italian Alps is a glowing pair of garnet-shaped structures that serve as a stop along the Timmelsjoch High Alpine Road. 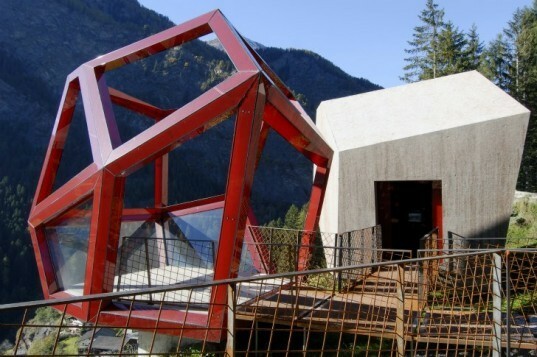 Modeled on the geological rock formations found in the Passeiertal valley, the Garnet pavilions offer an exhibition room and a viewing platform that educate travelers about the natural surroundings and local culture. 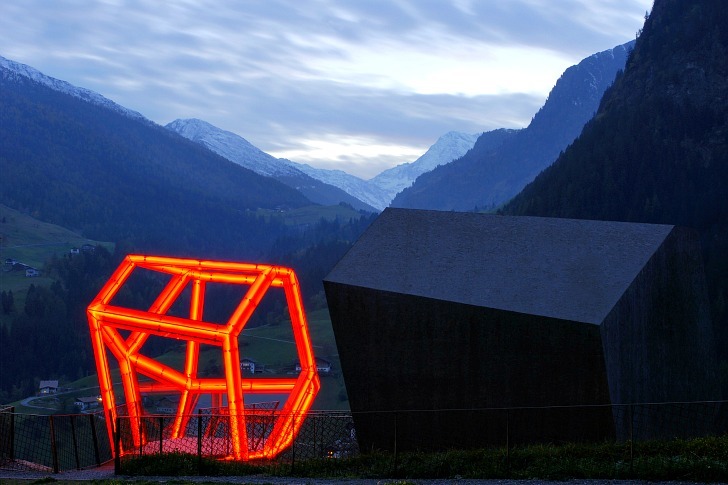 This pavilion is the first sculpture to be built along the road as part of the Timmelsjoch Experience. Designed by Werner Tscholl, the Garnets are made from glass, steel and locally-sourced concrete, and they glow a brilliant red with the help of LED lights at night. The Timmelsjoch is a well-known high mountain pass that links the Ötztal Alps along the border between Austria and Italy. The pass has historically been an important route for travel and is now famous for its hiking, climbing and recreation options. The Timmelsjoch Experience was created to help promote the area and make it more accessible for tourists. As part of the program, there are a series of outdoor sculptures slated for the area and the first to be built was Garnets. Taking inspiration from the geological rock formations of the nearby valley, Werner Tscholl designed two pavilions shaped like faceted gems to serve as a viewing platform and exhibition room. Inside, the exhibition room enlightens travelers about the environment, nature, geologic features, the history of the area, the culture of the communities and the economy of the region. Hikers and travelers along the road can stop to enjoy the sights or it can be accessed via bus and the sculpture serves as a creative bus stop. The exhibition room is built out of concrete with aggregate from the region while the pavilion is built from recyclable glass and steel. LED lights illuminate the sculpture at night and transform it into a glowing red cage. The Timmelsjoch is a well-known high mountain pass that links the Ötztal Alps along the border between Austria and Italy. The pass has historically been an important route for travel and is now famous for its hiking, climbing and recreation options. The Timmelsjoch Experience was created to help promote the area and make it more accessible for tourists. As part of the program, there are a series of outdoor sculptures slated for the area and the first to be built was Garnets. Taking inspiration from geological rock formations of the nearby valley, Werner Tscholl designed two pavilions shaped like faceted gems to serve as a viewing platform and exhibition room. Inside the exhibition room enlightens travelers about the environment, nature, geologic features, history of the area, culture of the communities and economy of the region. Hikers and travelers along the road can stop to enjoy the sights or it can be accessed via bus and the sculpture serves as a creative bus stop. The exhibition room is built out of concrete with aggregate from the region while the pavilion is built from recyclable glass and steel. Inside the exhibition room, images and descriptions give information about the area. A video display in the center shows examples of the area. LED lights illuminate the sculpture at night and transform it into a glowing red cage.